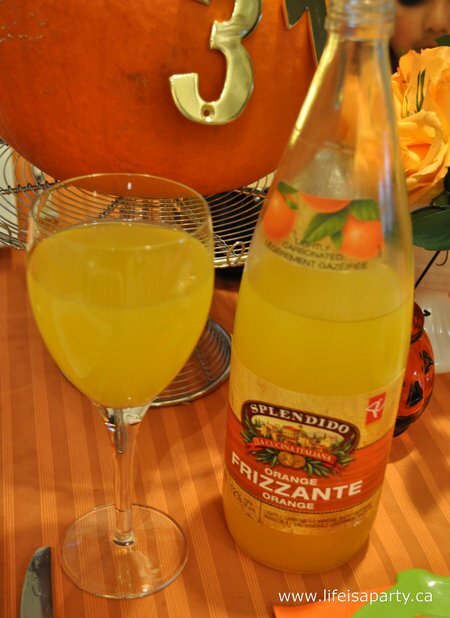 We’re not so into the gruesome side of Halloween, but we love any occasion for a party, so today I’m sharing a fun Orange Halloween Dinner, for anyone interested in a not so scary way to celebrate. (I told you yesterday we get a lot of mileage out of pumpkins around here.) 😉 And, you still have time to throw your own version of this together for the weekend. The idea was to have only orange food, but first the table. 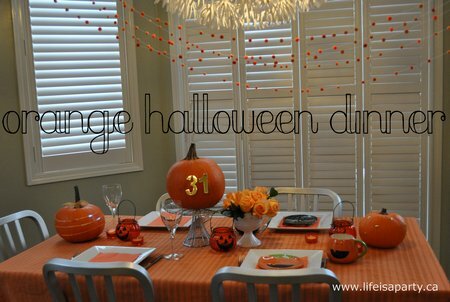 I had a great time pulling together all the orange I could find, but you could definitely do a simpler version, or even just use plastic disposable orange plates. I started out with this great little orange tablecloth, fabric from the clearance bin, only $1.50 metre. 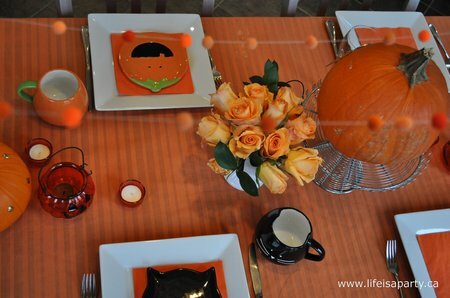 I used some square plates, and these fun Halloween dishes my girls got a few years ago from their Auntie. For the centre piece I used three orange pumpkins. 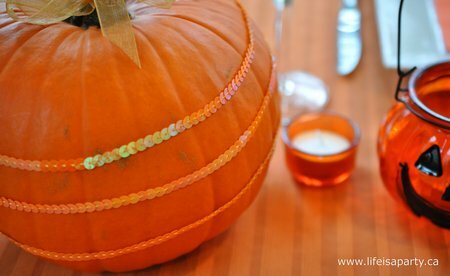 One I decorated with orange sequins, held in place with a few straight pins. 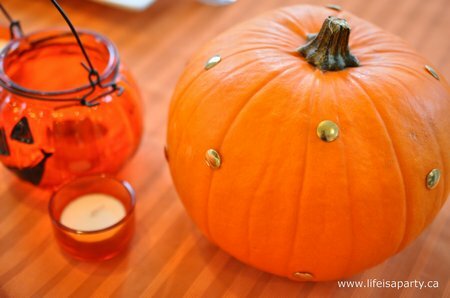 The next little pumpkin I decorated with gold thumb tacks. 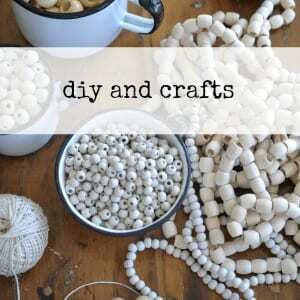 Really easy, and it turned out so cute! 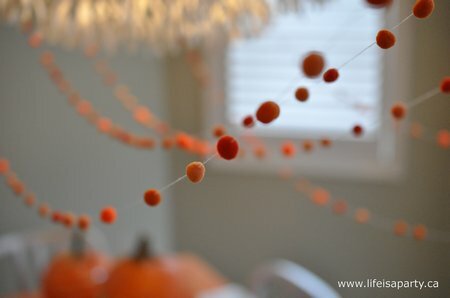 One of my favourite elements of this little table though, was the pom-pom garland I made. 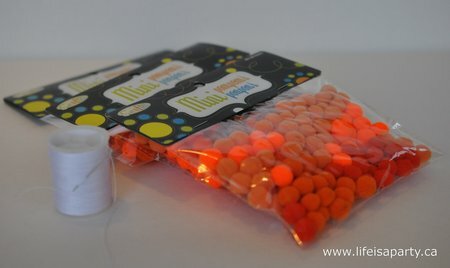 I found these bags of orange pom-poms with assorted shades in them. I just strung them randomly on long pieces of thread. And I heart how they turned out. 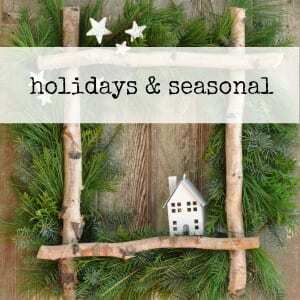 I’m already thinking about making versions in other colours for other holidays and parties. Now on to our menu. I made roasted carrots, orange cauliflower, and butter chicken with rice and naan bread. And, after cooking it, it stayed orange. 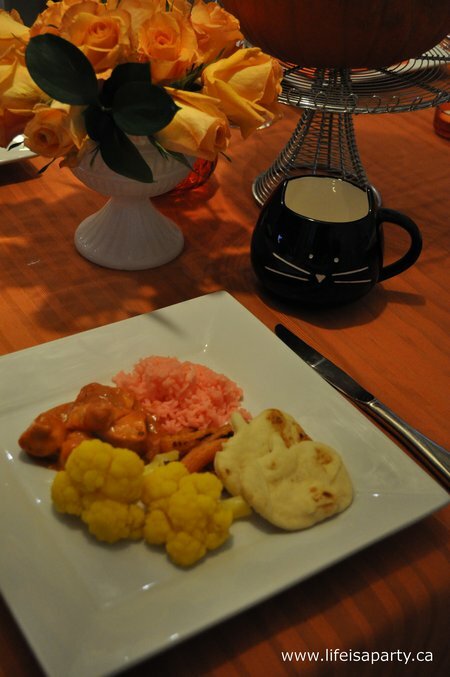 I made the butter chicken from a simple jarred sauce, and the naan bread was from the grocery store too. If your kids aren’t into butter chicken like mine are, another idea would be to make mac and cheese. I added a few drops of red and yellow food colouring to the rice water to make orange-ish rice, which by the way the kids thought was weird and Maddie didn’t want to eat. 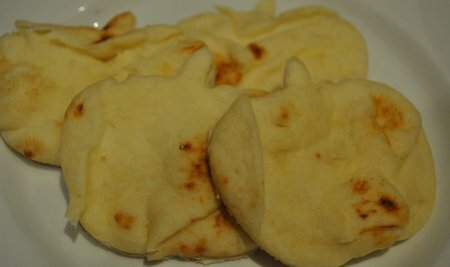 To Halloween up the naan bread, I used a cookie cutter to make it pumpkin shaped. 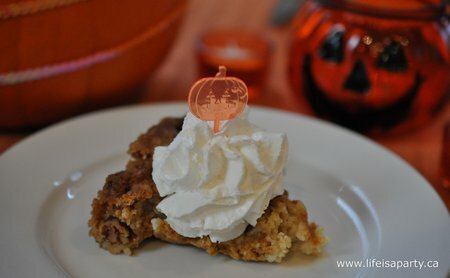 For dessert I made pumpkin pie cake, or pumpkin dump cake as it’s sometimes called since you basically just dump the ingredients in a baking dish. 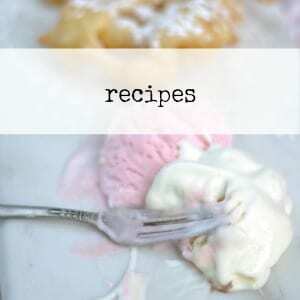 I got my version of the recipe here at allrecipes.com, but I’ve seen it all over and wanted to try it. It was yummy, and supper easy to make. I might have had to take a picture of this, this morning, and I may or may not have had a few bites before even having breakfast. 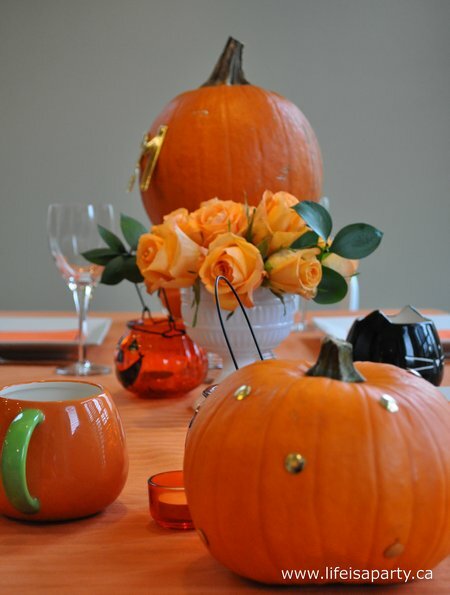 With an all orange dinner, life really is a party! Happy Halloween! 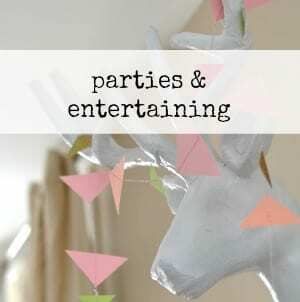 This post is linked up at Between Naps on the Porch, The Shabby Creek Cottage, Craftberry Bush, Whipperberry, Tidy Mom, Craftionary, Tatertots and Jello, The Shabby Nest, Home Stories A to Z, Uncommon Slice of Suburbia, and 36th Avenue. Very cute! 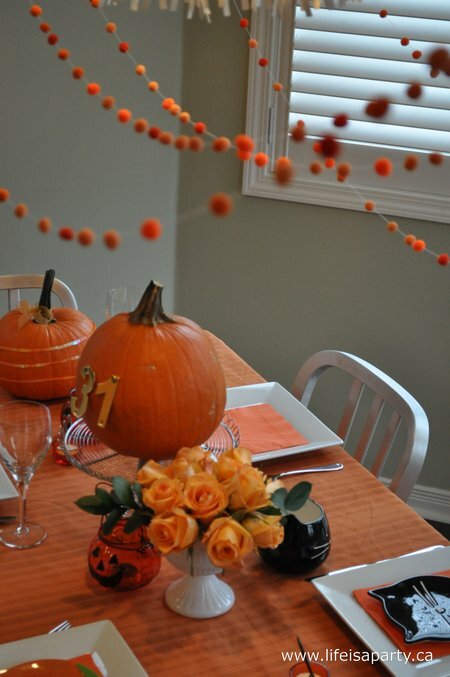 Love the studded pumpkin, the orange roses and the pompoms! My favorite part, the matching food, of course. Thanks for sharing, visiting from Between Naps on the Porch. I’m stopping by for a blog visit from Between Naps on the Porch today. 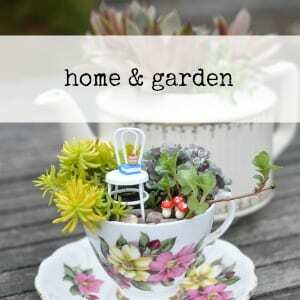 I’m a urge fan of her tablescapes. Autumn is my favorite time of year. The decorations, colors and textures that you chose are so beautiful. People should never underestimate the savings and items that can be purchased at discount stores. My favorite discount store is Big Lots. I love it! What a great idea! The sequines on the pumpkin is great. All Orange is a very goo thing! 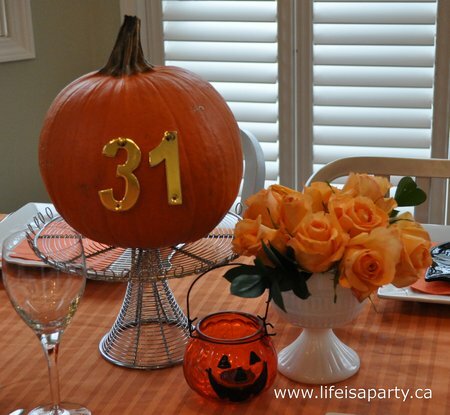 A great way to celebrate Halloween is with this non scary table. 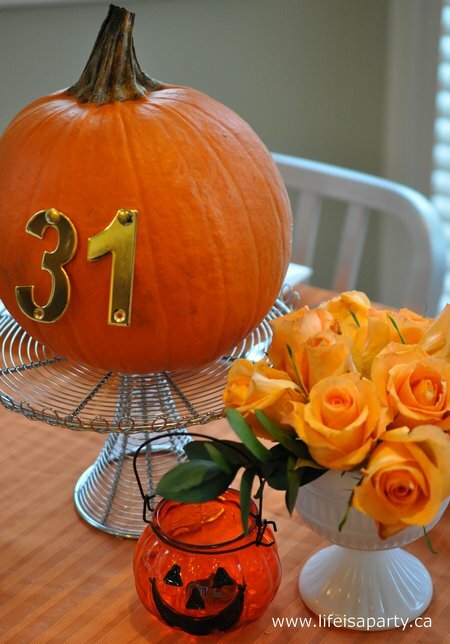 The pumpkins are so cute and creative. Hope your chrldren have a fun time on Halloween.